Although it is usually best not to take head-on shots of birds, I can’t help but post this image of a Barn Swallow (Hirundo rustica) looking at me with angry eyes. I don’t know if the swallow qualifies as an Angry Bird, but there is no denying the intensity of the stare. 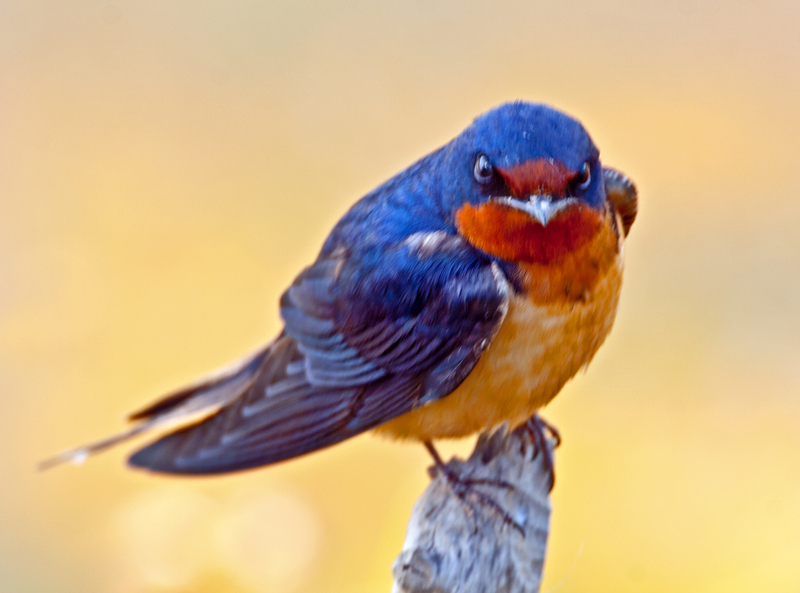 What does go on in the minds of barn swallows when they encounter us? Thanks. You gotta love a look like that. Why, when I look at this image, am I reminded of Mighty Mouse? This provides a much closer look at a bird that most of us see only fleetingly, and usually in unbelievably graceful motion. I applaud this new interest of yours, Mike, and look forward to more. Keep it up, please! I have special access to the barn swallows because they nest underneath the boardwalk at my local marshland park and perch nearby sometimes. Because they are slightly below me, they seem to be somewhat unaware of my presence, which lets me get shots like this. It is a very interesting expression. I have always assumed their whole thought process was about the next meal, maybe I have over simplified. You’re probably right, Charlie, but many of us have been so influenced by Disney films that we like to attribute human traits to animals and birds. He doesn’t look real happy, does he?